Your GE ENERGY STAR 21.2 cu. ft. Top Freezer Refrigerator in Black easily accommodates gallon storage. This Frost Free refrigerator is icemaker ready for the IM4D optional ice maker sold separately. The Deluxe Quiet Design and Never Clean Condenser allow for complete ease of use. Easily reversible door hinges lets you set up your refrigerator for the best use. Maytag 33-inch Wide Top Freezer Refrigerator with PowerCold Feature- 21 cu. ft.
Maytag. top-freezer refrigerators are built to hold the cold with features like the PowerCold. feature that chills down the refrigerator to help keep everything cool with the touch of a buttoneven if the whole family's been browsing with the door open. Plus, fingerprint resistant stainless stainless steel keeps this fridges looking great. Inside this 21 cu. ft. model you'll also find the BrightSeries LED lighting. It casts a bright, white light and uses less energy than incandescent bulbs. 33-inch W 21.2 cu. 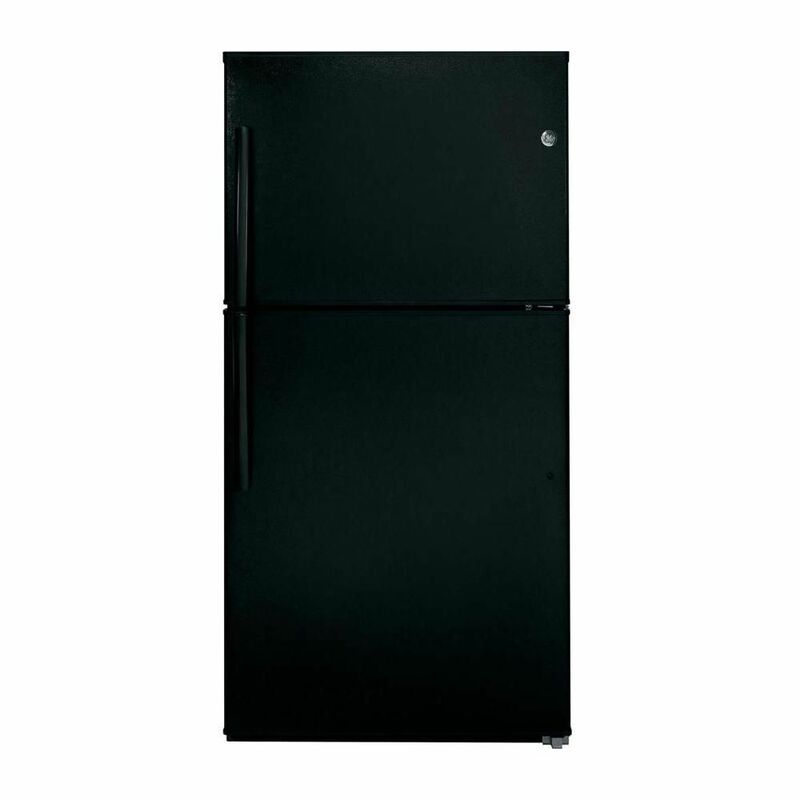 ft. Top Freezer Refrigerator in Black - ENERGY STAR® Your GE ENERGY STAR 21.2 cu. ft. Top Freezer Refrigerator in Black easily accommodates gallon storage. This Frost Free refrigerator is icemaker ready for the IM4D optional ice maker sold separately. The Deluxe Quiet Design and Never Clean Condenser allow for complete ease of use. Easily reversible door hinges lets you set up your refrigerator for the best use. 33-inch W 21.2 cu. ft. Top Freezer Refrigerator in Black - ENERGY STAR® is rated 3.7 out of 5 by 319. Rated 5 out of 5 by Crystal_Kennedy from Beautiful I received this appliance as a program incentive. The unit is beautiful and I love the space, drawers, and overall layout. I am also looking forward to the energy savings. Rated 1 out of 5 by Wantedreplacement from Shelving/ crispers stink.no height tall bottles This only model for color replacement for TBX21IIBRRAA. Crispers are too big. We need more space on shelves. Main shelves too narrow top to bottom and hard to reach back into. No split adjustable either. Full width only. Door shelves designed for bigger crispers and are not adjustable. Makes access to bottom shelf hard on back. Freezer fan tower does not allow for filling freezer as ice cream stays soft. And NO separate freezer control. ICE maker tray not snug against wall. Old model had split door shelves, separately adjustable. Pathetic design for capacity when replacing 2001 model with similar color. Rated 5 out of 5 by RB1963 from Everything we need in a fridge. Thanks GE! Great product great value from GE! Would recommend to all ... thanks! Rated 5 out of 5 by AM in NC from Spacious I was pleasantly surprised by how much space it has both in the fridge and the freezer. Easy access for organizing and cleaning. Energy star, quiet and efficient. Rated 2 out of 5 by New Build Not My Choice from Noisy! Two major issues with this fridge; it makes all kinds of really loud noises and it’s shelf configuration is really bad! It wheezes and rambles, don’t know if I have a bad motor on a brand new model or what. And as for clever design, this model really has no room where needed. If I make more room, enough to actually get bottles and jugs on top shelf, then I lose the entire middle shelf because of the drawers! It’s terrible. Rated 2 out of 5 by Gvk1 from Disappointed Noisiest fridge, ice container too small cubes keep flying over back to lower section. Finally got the door of fridge to stop squeaking every time I open and close. Rated 1 out of 5 by Nana mel from Poor Fearures I would never have bought this if U saw in a store. No freezer light shouldn’t need kitchen light to see what your looking for.. cutting back on feature? Top door shelve not adequate for tall bottles which I had in previous frig.. had to take out butter holder to accommodate. My old Frid had more room. Only good feature is slate finish. Purchased all 4 appliances .. will never by GE again. Very poorly made. Was a previous GE customer. Rated 2 out of 5 by RossJ from Poor value Not happy with our purchase. The refrigerator door will not always close all the way and items towards the back of the refrigerator will freeze.